Clash for a Cure registration opens today. Play some games for a good cause (because as much as you think it might be, just 'pwning noobs' is not a good cause). 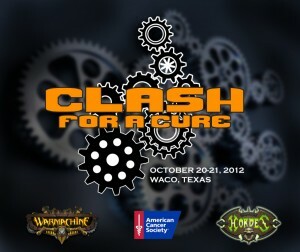 Pre-registration opens up for Clash for a Cure 2012 on August 6th. Last year Clash was the largest Charity Tournament in Texas, and this year we have pulled out all of the stops! In 2011 we sold out with almost a month before the event, so don't delay! Goody bags of course will be available for all two-day pass holders, and this year we have also included the afternoon meal at the event both days. This year, the door prizes...well there is a long list from a bunch of great sponsors...don't miss out!